Today I'm showing you the final set of Broadway Bound samples made for my recent Stamp Camp. First we have a really cut tag card. I actually got the girls to make two of the tags, so they had one for on the card & one for on the gift. It's a simple Basic Black cardstock base. 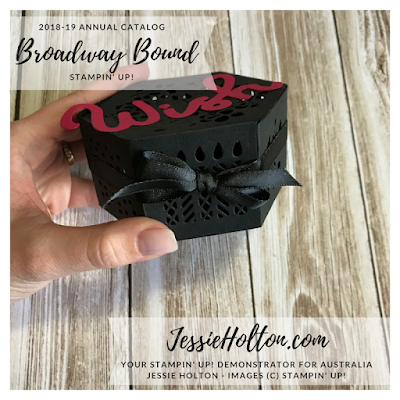 First adhere your smaller strip of Broadway Bound DSP onto the card front piece & then tie your ribbon around it & bow. Then adhere that to the card base. The ribbon is easier to tie around two pieces of DSP as it's less flimsy & this DSP feels a bit thicker than most. 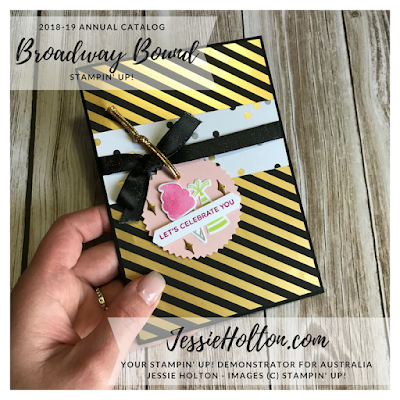 Then make your tag with a Petal Pink Starburst Punch & the gold diamonds are from one of the die cuts in the Broadway Birthday Bundle. There are also framelits for each of the other pieces, a Granite Gray cone, stamped off Lovely Lipstick ice cream & Lemon Lime Twist hat. Stamp your sentiment in Lovely Lipstick & cut with the Classic Label Punch. Hole Punch & then tie the Gold Cord through the tag & ribbon. I've also used a Dimensional on the back of the tag to secure it to the card front. Next we have a matching Hexagon Box (Window Box Dies) in Basic Black with all the inserts. You need two Hexagon die cuts to make the box. Remember to turn your side inserts around the opposite way for one of the die cuts as one of the pieces will be on the bottom & so upside down. You can also remove the floral insert from the bottom die cut as you won't be able to see it. Tear & Tape is best for sticking the box together. 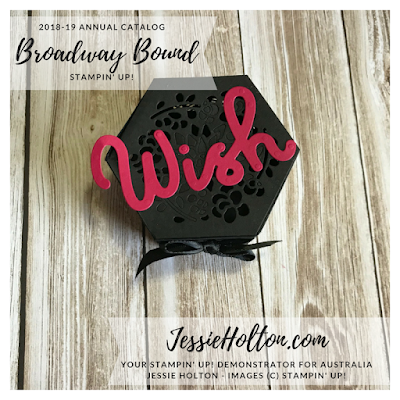 I've made the 'wish' sentiment the same as previous cards, sticking an Adhesive Sheet onto the back of the cardstock before die cutting, so all you need to do is peel & stick. Remember to keep hold of your dot for the letter 'i'. I've used Black Shimmer Ribbon to tie a bow around the front. I love this ribbon!